Language is an important component of an evolving culture. Herstorically, language has been used to define and articulate power dynamics, positionality, and social norms. As advocates, activists, changemakers, and influencers have fought for the rights of people who have been sexually assaulted, violated, or abused, language has been equally important. As a collective, FORCE acknowledges that there is not one term that adequately identifies the experiences and realities of every person affected by sexual violence, assault, intimate partner violence, and abuse. The terms used to denote those affected by these forms of violence are just as varied as the experiences of those who have been assaulted or attacked. It would be irresponsible of us to ignore the complex and intersectional debate on language and agency. For purposes of simplicity and through our collective decision making process, we’ve chosen to use the term survivor to affirm the ability of people who have been violated to live beyond this traumatic event. The term survivor also describes someone who is going through the healing/recovery process or when discussing the short and long term effects of sexual assault on the person attacked (RAINN, 2019). Other schools of thought suggest the term victim or survivor should be used based on the particular state’s legal terminology so that the acts of violence can be effectively tried (RAINN, 2019) . Other terms include: victim which is often used to refer to someone who has been recently sexually assaulted or when directly interfacing with the criminal justice system (RAINN, 2019). Victim is also used to express that great harm and pain have been caused to the person attacked and that a crime has indeed taken place, or to refer to those who did not survive. 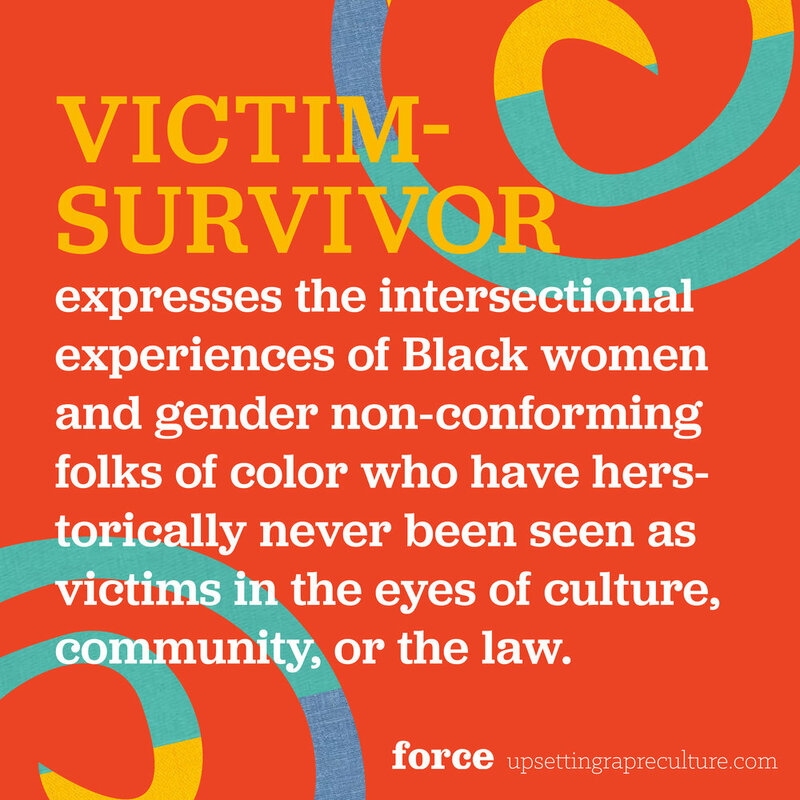 Victim-survivor has been used to express the intersectional experiences of the most marginalized groups affected by sexual assault, violence, and abuse such as Black cis-women, Black trans-women, and gender non-conforming folks of color who have herstorically never been seen as victims in the eyes of culture, community, or the law. Victim-survivor acknowledges the reality of vulnerability and triumph as well as the need to acknowledge various connected oppressions that can further complicate the already traumatic experience of sexual assault, intimate partner violence, and abuse. As Audre Lorde states ‘There is no such thing as a single-issue struggle because we do not live single-issue lives.’ Pro-survivor means working to prioritize the rights of the person attacked and helping them to define their own experience. Additionally, to reflect that a terrible act was done to someone without stripping their agency, the following terms place the onus of wrongdoing on the preparator or attacker rather than the person who was attacked: ‘a person who was subjected to sexual violence’; ‘a person who was sexually assaulted’; and ‘a person who survived sexual abuse’ (Diversity Style Guide, 2019). One of the unifying factors of any act of sexual violence or assault is that these are not crimes of passion or sexual desire, but crimes to strip and transfer power from the person who was attacked. The best way to support those attacked is to ask them how they want to refer to themselves and honor said request. It reaffirms your support for their need for agency and autonomy (RAINN, 2019). Written by Charnell Covert. Designs by Connie Zheng.